Recent researches have demonstrated the usefulness of photoacoustics in non-destructive control, in particular, in the monitoring and diagnosis of works of art. Indeed, it is fundamental to preserve the artworks’ integrity by using techniques not involving direct contact or damaging radiation, or pre-treatments. On the other hand, a lot of artistic heritage consists of paintings that are complex systems, where, often, the presence of highly scattering and semi-opaque materials make useless optical techniques. Consequently, in this context photoacoustics represent a powerful tool. 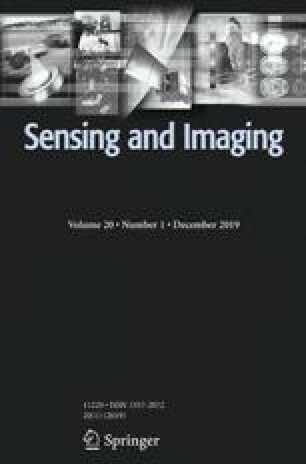 This work is aimed to evaluate the quality of reconstructed RGB images of simple test objects examined by means of photoacoustic signals, in order to confirm the potentiality of this promising investigation method. Only a single-wavelength excitation source at 1064 nm was available and so, it has been necessary to perform some preliminary processings on the sample color images. The original images have been decomposed in R, G and B components; each of them has been converted into grayscale code, printed on transparency film and then investigated through photoacoustics. After that, the three generated photoacoustic images have been recombined to produce the reconstructed RGB image. A complete experimental system has been set to analyse dedicated test objects. The resulting images have been compared to the original ones, by using standard image quality parameters. Similar results are expected to be obtained by using three sources of distinct wavelengths (Red, Green, Blue), making the method easier to apply. Authors desire to give a special thanks to FONDAZIONE CASSA DI RISPARMIO DI PISTOIA E PESCIA (Pistoia, Italy) that has kindly concessed the use of the trademarks adopted in photoacoustic image reconstruction experimentation. Patterson, M. P., Riley, C. B., Kolios, M. C., & Whelan, W. M. (2011). Optoacoustic signal amplitude and frequency spectrum analysis laser heated bovine liver ex vivo. In IEEE International Ultrasonics Symposium Proceedings, Conference Proceedings (pp. 300–303). https://doi.org/10.1109/ultsym.2011.0072. Biagi, E., Cerbai, S., Masotti, L., Belsito, L., Roncaglia, A., Masetti, G., & Speciale, N. (2010). MOMS technology for fully fiber optic ultrasonic probes: A proposal for virtual biopsy. In 2010 IEEE Sensors (pp. 1156–1160). https://doi.org/10.1109/ULTSYM.2009.5441697. Biagi, E., Cerbai, S., Masotti, L., Belsito, L., Roncaglia, A., Masetti, G., & Speciale, N. (2009). Fiber optic broadband ultrasonic probe for virtual biopsy: Technological solutions. In 2009 IEEE International Ultrasonics Symposium (IUS) (pp. 200–203). https://doi.org/10.1109/ULTSYM.2009.5441697. Biagi, E., Cerbai, S., Gambacciani, P., Acquafresca, A., & Masotti, L. (2006). Fully fiber optic ultrasonic probes for virtual biopsy. In Presented at the proceedings—IEEE ultrasonics symposium (Vol. 1, pp. 556–559). https://doi.org/10.1109/ultsym.2006.144. Belsito, L., Mancarella, F., Ferri, M., Roncaglia, A., Biagi, E., Cerbai, S., et al. (2011). Micro-Opto-Mechanical technology for the fabrication of highly miniaturized fiber-optic ultrasonic detectors. In Presented at the 2011 16th international solid-state sensors, actuators and microsystems conference, TRANSDUCERS’11 (pp. 594–597). https://doi.org/10.1109/transducers.2011.5969725. Study of the Conditions of Irradiating Laser for Removal of Toner from Used Paper. (2009). Retrieved January 29, 2019, from https://www.jstage.jst.go.jp/article/ieejfms/129/4/129_4_205/_article/-char/en. Emelianov, S., Aglyamov, S., Karpiouk, A., Mallidi, S., Park, S., Sethuraman, S., et al. (2006). Synergy and applications of combined ultrasound, elasticity, and photoacoustic imaging. In 2006 IEEE international ultrasonics symposium, IUS (pp. 405–415). Presented at the 2006 IEEE International Ultrasonics Symposium, IUS. https://doi.org/10.1109/ultsym.2006.114. (12) IMAGE QUALITY PARAMETERS: A short review and applicability analysis. (2016). ResearchGate. Retrieved July 17, 2018, from https://www.researchgate.net/publication/308995206_IMAGE_QUALITY_PARAMETERS_A_short_review_and_applicability_analysis. New Frontiers in Materials Science for Art Conservation: Responsive Gels and Beyond—Accounts of Chemical Research (ACS Publications). (2010). Retrieved February 8, 2019, from https://pubs.acs.org/doi/abs/10.1021/ar900282h.